The Dennison family is seen here gathered at their ranch in the Upper Valley in 1897, possibly for the celebration of New Year’s Day. The younger members are prepared to play tennis, while the older members are seated on chairs alongside the court, well-wrapped against the chilly air. Seated at the rear center is a bearded man, Henry Jackson Dennison, head of the family. He looks old in this picture, but he lived another twenty years. He and his wife had many children, grand-children and inlaws, as this photograph attests. 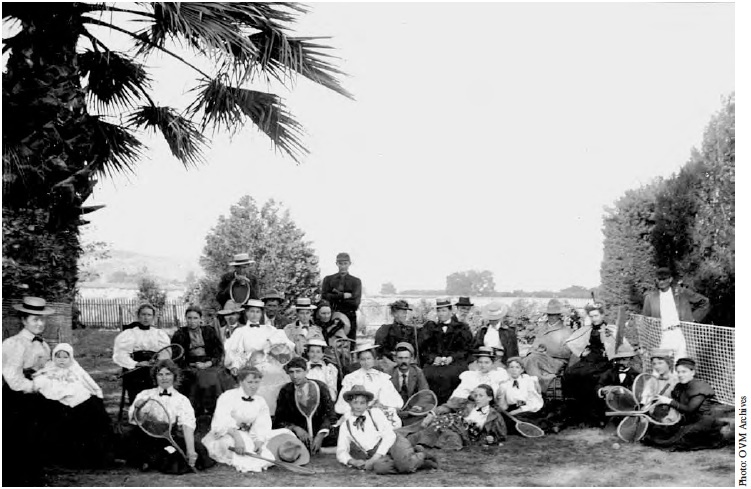 The Ojai Valley Tennis Club had been formed about a year earlier, and its first Valley-wide tournaments were played in 1896. Nina and William Soule were the first mixed-doubles champions that year. It seems probable that some of the persons seen in this picture participated in those first tournaments. Three of Henry Jackson’s sons stand at the rear, from left to right: Rapp, Schuyler and Waldo (behind the net). At the far left is Henry’s daughter, Lulu Dennison Mallory, holding her daughter Margaret on her lap. The infant was born in October 1896. At the lower center of the picture is a young woman who romantically holds a bouquet of flowers on her lap. At the far right is a smiling young woman wishing us good luck by displaying a four leaf clover constructed of tennis rackets. Note that the Dennisons seemed to have had trouble properly trimming their palm tree. Tennis anyone? Can you find the tennis ball in the picture?